Their numbers are growing rapidly and their territory is spreading. Can anyone stop them? The young hog appears bewildered, terrified. Running through the grass along Buckner Boulevard, near White Rock Lake, the desperate animal barrels across two lanes of speeding traffic, then wheels around and darts back in front of drivers who seem as confused as the hog. Some cars slow down. Others stop and wait. A few swerve and speed away. How many of those animals are roaming Dallas proper is, again, hard to say. The number could be as low as a few hundred, or it could be a few thousand. If that’s what happened, then the blame is being placed squarely where it belongs—with us. It also would mean that what’s happening in Lake Highlands has been going on in Texas for nearly 500 years. European pigs were first brought to what is now the United States in 1539 by the Spanish explorer Hernando de Soto. After looking for gold in the Southeast, in 1542, his exploration party brought 700 pigs to the territory that would become Texas. The men would release the pigs to scavenge for food, then later hunt them. But left to their own devices, the pigs changed into almost unrecognizable feral creatures, a metamorphosis that wildlife biologists say our domestic pigs are still capable of. If you take a pig from the State Fair of Texas and release it into the wild—and if it survives—the pig will not look the same in a year. By the second generation, that animal’s offspring will have gone “hog wild,” having been transformed in the same way European hogs were when they were set free centuries ago. Today, the hogs tearing up land in the Trinity Forest and bedeviling suburban homeowners are evolutionary marvels. They are one of the smartest species found in the United States. A 200-pound male can run 30 mph, and it can pick up certain scents from up to 7 miles away—and 25 feet underground. It has continuously growing tusks, two on top and two on bottom, that scrape against each other, keeping them sharp. They eat everything and anything. In fact, in a pinch, they’ll eat each other. In Australia, where wild hogs are also a problem and the environment offers less to eat than we have in Texas, the most successful bait for hog traps is the corpse of another hog. They breed like bunnies, beginning early, at less than a year old. With plentiful food, they breed even more frequently. Two litters a year of 10 piglets each is not unusual for a well-fed sow in the wild. They breed so fast that just to keep the population in check, we would have to kill between 60 and 80 percent of the hogs in Texas. Hunters here take out less than 24 percent. It’s hard to know exactly how much damage they do. A 2004 survey conducted by Texas A&M AgriLife Extension Service put the annual agricultural damage in the state at $52 million. There could be 4 million wild hogs in Texas. How many of those animals are roaming Dallas proper is, again, hard to say. The number could be as low as a few hundred, or it could be a few thousand. We rarely see them—just the destruction left in their path. We know they are tearing up the Trinity Forest, chewing up land in South Dallas, and hoofing it to the L.B. Houston Nature Area. They’ve filled traps at Keeton Park Golf Course. They move from location to location on the city’s hog superhighway, our creek bottoms and green belts. They’ve been reported basking in the beauty of Turtle Creek and have broken the hearts of conservationists who have spent hundreds of hours planting native prairie flora at Big Spring, the only natural feature in the city to have been designated a historic landmark. It turns out the hogs like Dallas as much as we do. Right now, as you read this, Dallas’ feral hogs are out there—rooting and running, ripping things up, grunting and eating and breeding—and their numbers are growing rapidly. Only one man stands between us and them. Thank God he’s an Eagle Scout. Brett Johnson is a quiet urban wildlife biologist who was hired by the Dallas Park and Recreation Department to push back on our porcine invasion. He is so at home outdoors that he prefers to do interviews under the trees outside his South Dallas office, even when it’s spitting rain. So far, he has set up five traps in secret locations on and around Dallas parkland, and he is pulling in hogs on a regular basis. He doesn’t like to talk numbers, preferring instead to focus on how much he can reduce hog-related damage, but in August the Dallas Morning News reported that in the five preceding months, 40 hogs had been trapped. Johnson hopes to someday have 15 to 18 traps citywide. He loves to talk for hours about hog psychology and their humbling intelligence. Johnson’s approach stands in stark contrast to state policy. Texas, eager to get rid of as many hogs as possible, allows year-round hunting, using almost any weapon imaginable. The state rules for taking out a hog can be, let’s say, flexible. There are places not far from Dallas where a hunter can pay for the chance to kill a hog in a small pen with a big knife. There are ranches that welcome hunting with spears. (They are not eager to publicize this fact, however, and asked that their names be withheld.) Assault weapons and high-powered bow hunting are standard operating procedure. One Texas rancher bragged to me about luring pigs into a ravine on his property with a special concoction of corn mash and Jell-O, and then blowing the hogs up by throwing sticks of dynamite on them. Johnson diplomatically calls practices like that “rural solutions.” Not only are they not possible in the city, but, he says, in the long run, they just don’t work. As a lifelong hunter himself, Johnson worries that some of the choices Texas has made about wild hogs have led to more of them rather than fewer. And he wants people to know that in wildlife management, everything is interconnected. Mayer was part of a National Geographic investigation that looked into the legendary Hogzilla, an allegedly 1,000-pound pig that was killed in Georgia more than a decade ago. He determined that it was a hybrid, part domestic and part European, like most of our feral hogs. He estimated that it actually weighed closer to 800 pounds, the size of some hogs that have been killed in Texas. But he says hogs that size aren’t really wild. Truly wild hogs top out at about 400 pounds—still massive and still meaner than hell but not the size of a Ford F-150. Wild hogs have to stay on the move, looking for food. He says those XXL hogs are “fed hogs,” feral pets that fatten up because they have ready access to food that is replenished on a regular basis. 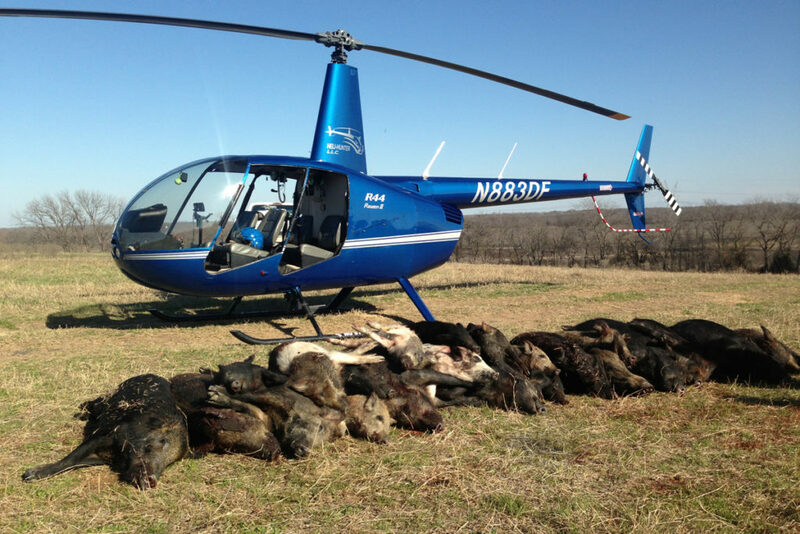 Chop Chop: Ennis rancher Craig Meier’s Heli-Hunter company charges groups up to $15,000 to kill hogs in aerial hunts. He books his entire season—with shooters from as far away as China and Japan—in a week. Photo courtesy of Mary Mapes. Mayer believes the best answer to the hog problem may be the hardest to sell to the public: banning hog hunting outright. “North Dakota, Kansas, Delaware, Nebraska, and other states are close to being pig-free now because they took the money out of hog hunting. There are no more guided hog hunts. They are treated like vermin. Ranchers can’t charge people money to hunt hogs on their property. They cannot possess hogs or feed hogs or brag about the size of their feral hogs. 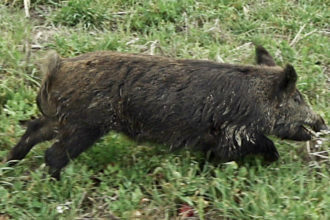 But the fact is that wild pig hunting in the South is so deeply ingrained in the culture that I don’t know that a ban could ever work in Texas.” In fact, Mayer says, when one Tennessee wildlife biologist suggested a ban on hog hunting at a public meeting, he had to be escorted out of the building for his own safety. Ennis Rancher and auctioneer Craig Meier doesn’t see things Mayer’s way. For about two months each year, he flies a helicopter low, over the flat open scrub outside Dallas, with hunters who pay big money to fire tactical weapons at feral hogs as the sounders run for cover. His company is called Heli-Hunter. Tagline: “High on the hog has a whole new meaning.” But Meier bristles at people who think he and his team are “bloodthirsty idiot rednecks. We are actually entrepreneurs,” he says. Meier and other nearby ranchers began to pay the state to fly over in a helicopter and systematically take out pigs, maybe bagging 100 to 200 hogs over a weekend. One day, as he watched the state chopper fly over, he had an idea. He bought a helicopter and began patrolling land for nearby ranchers who paid him a dollar an acre to hunt pigs on their property. In 2011, when the state passed its “pork chopper” bill, allowing hunters to pay Meier for the privilege of shooting hogs from the air, things really took off. Johnson’s hardest work may be with city people who listen to everything he says about the danger and destructiveness of wild hogs—and then ask if they can keep one as a pet. He is very proud of another element of his business. Most of the meat goes to charity through a Christian group called Hogs for the Cause. He estimates that his operation donated 27,000 pounds of pork sausage to the poor in one season. The helicopter hunts are not cheap. A six-hour hunt for up to eight gunners runs $15,000. There is an additional charge for lodging and a $200 charge for an edited video of the hunt. Back in Dallas, Brett Johnson is not just trying to control the city’s pigs. 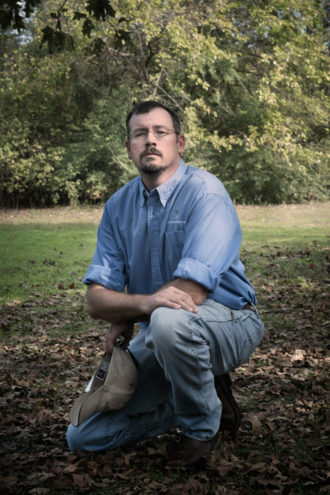 His hardest work may be with city people who listen to everything he says about the danger and destructiveness of wild hogs—and then ask if they can keep one as a pet. It is crazy indeed how our complicated relationship with this iconic Texas animal mirrors the growing rural-urban divide. But, in this instance at least, the division may be more in the perception than the reality. If people who live off the land are fighting to protect a way of life, and people who live in cities are fighting to protect the land and native fauna—and to keep these beasts out of their backyards—it may turn out that these different ends may be best achieved through similar means. If mass hunting leads to greater destruction of both farmland and wild lands, then it’s not a solution for anyone. Least of all the wild hogs. Who may turn out to be smarter than us all.